We take great pride in our line of teas. The blends are our own, the ingredients are certified organic or certified naturally grown, and of the finest and freshest quality. All are blended not only with flavor in mind, but also the wonderful benefits you will receive from drinking fresh, organic herbal teas. Each package makes 10-12 cups of tea. Flavor is tart and may need to be sweetened with honey. Beautiful, ruby colored tea. Very high in Vitamin C.
Mild lemon flavor. Very powerful antioxidant, recently discovered that it is even more powerful than Vitamin C and Vitamin E combined. Drink one cup before bedtime for sleep, good substitute for chamomile. Good for some forms of asthma, coughs, headaches, and is a moderate sedative. 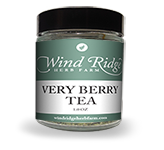 Combines lemon flavor of above tea with the fruity, soothing flavor of raspberry leaf. 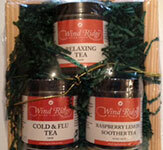 Calming tea, while raspberry leaf affects the female reproductive organs by regulating hormones. Great PMS tea or for menopause symptoms. Smooth, flavorful tea, loaded with Vitamin C. Has a very subtle mint undertone. Robust, full bodied flavor with fruity, berry taste. Good ‘tonic’ type tea, loaded with powerful antioxidants and many soothing ingredients. Bland flavor, lets mint shine through. Alfalfa is rich in vitamins and minerals, and is believed to relieve arthritis, and other twinges, to stimulate appetite, and aid in digestion. Zesty lemon tea with just a touch of spicy ginger root. Very smooth, with loads of Vitamin C from lemon peel, hibiscus flowers, and rose hips. Great antioxidant properties to keep colds and flu away. This tea tastes great when you are starting to feel that old cold bug start to get you down. It has the antiviral properties of ginger, lemon balm & elderberries, plus loads of Vitamin C from orange peel, rose hips and hibiscus flowers. Helps with coughs from our friend lemon balm, and soothes congestion with peppermint. Drink 3-4 cups per day at the onset of symptoms. Fragrant, sweet tea. Combines green tea with jasmine flowers. Jasmine is calming, while the green tea adds antioxidants. Soothing flavor, very smooth, with refreshing mint added. Nettles are very high in iron, a rich source of 14 of 16 essential minerals. Nettles are also believed to be anti-inflammatory, useful for allergies and arthritis. Another seasonal favorite. As with Cinnamon Orange Tea, this tea is high in Vitamin C, and antiseptic herbs to be a very flavorful cold and flu fighter. This tea contains cloves and other spices. Chamomile and raspberry leaf are known to relax nervous tension, while mint is thought to relieve ailments associated with nerves. Combines the antioxidant properties of green tea, lemon balm, and ginger together for a flavorful and beneficial tea, with a hint of peppermint. Ingredients in this tea are known to be helpful with the symptoms of menopause-hot flashes, night sweats, forgetfulness, etc. Drink a cup or two per day and enjoy the unique flavor. The herbs in this tea are known to target the gallbladder and liver, to help clean and protect these vital cleansing organs. The slightly bitter by pleasant flavor stimulates the production of bile by causing both organs to contract, while helping eliminate accumulated toxins. Each 7 oz package contains enough tea to complete a 2 week cleanse. Great for the tea lover on your gift list. All teas certified organic ingredients, caffeine free, full of flavor in a miniature wooden crate, tied with decorative raffia bow. Custom packaging available for Gift Crates, call for more info.